NetApp delivers industry leading all-flash and hybrid storage systems. 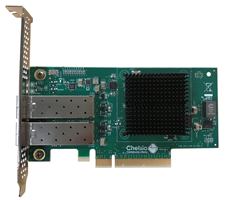 Chelsio T6 Unified Wire adapters are shipped with Netapp's AFF A800, A700 all-flash and FAS9000 hybrid storage systems. The AFF A800, A700 all-flash arrays deliver breakthrough performance in a compact form factor to modernize IT for demanding enterprise applications, analytic workloads, and cloud integration. The FAS9000 hybrid flash system delivers a new approach to storage with an integrated combination of scalable, high-performance hardware and adaptive storage software to support existing workloads as well as new applications. Note: The InstallShield installs NDIS function driver (v6.12.7.0) and firmware (v1.22.8.0). The driver supports NIC, SR-IOV, ND, SMB Direct, NVGRE, VXLAN Offload functionalities, PacketDirect, VMMQ (vRSS), RSSv2, Ring Backbone, SR, S2D, iSCSI, iSER and DCB. Please visit Chelsio Download Center to download the drivers for other operating systems.